is a graphics directive which specifies that surfaces of 3D graphics objects which follow are to be taken to have specularity s.
With specularity s, a surface is taken to specularly reflect a fraction s of light that falls on it from simulated light sources. 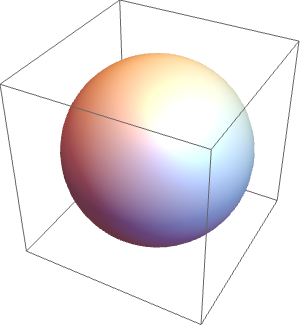 The default specular exponent is 1.5. Higher values lead to more sharply defined reflections, typical of shinier materials. Values above 10 produce definite "specular highlights". The intensity of simulated light at an angle from the mirror‐reflection direction is taken to be . When , the intensity is zero. Specularity[s] takes the reflected light to have the same color as the incident light from light sources. Specularity is equivalent to Specularity or Specularity[Black], and specifies no specular reflection. Specularity directives do not affect specifications from Glow or RGBColor.